We received an invitation some years ago to attend a singing Restaurant Show presented by H.A.H. in Toowoomba. Words cannot describe how delighted we were with the presentation by the male Harmony Group. We have attended each year and highly recommend this show. 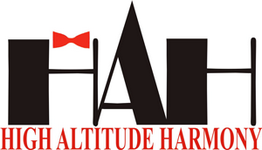 My husband and I have been associated with High Altitude Harmony since its' inception. We have participated in their long running Singing Restaurant, which has become a highlight on Toowoomba's cultural and social calendar, and in the Regional competition that they hosted two years ago. My husband has been made an informal member of this chorus, as has the rest of their quartet, such is the welcoming attitude of this group. As far as their ladies support group goes, they are second to none in their stalwart attention to detail and positive attitude in their assistance to these men to make HAH a successful and forward moving BBS harmony group. If you live in Toowoomba or its' surrounds and love to sing close, four part a'cappella/ barbershop, then I would suggest that you pay these friendly and professional people a visit...it may change your life!